Printed tin plates with a diameter of 26 cm. This original, unusual and entertaining process of printing on tin has been already used in the XIX century by artists like Mucha, who created this technique for the famous biscuit boxes. These plates are decorative, therefore you have to cover them with a transparent glass plate if you want to use them for a meal. You can use the tin plates directly for cocktail food presentation, such as canapés or snacks; however you must not stock the food on this kind of product. We are at your disposal for any further information. These original plates are from the very best French manufactories in XIXth century such as Creil & Montereau, Choisy-le-Roi or Vieillard in Bordeaux. These scenes are inspired from "A Tour of the Underwater world", by Jules Verne, published in 1869-70 to Pierre-Jules Hertzel. NEW COLLECTION The collection "Le Monde Renversé" (The Reverse World) is inspired by Grandville's illustrations from the book "La Vie privée et publique des animaux". This caricatural collection also reminds humanized animals of Jean de La Fontaine or later Beatrix Potter's characters. The original plates were produced by Jules Vieillard in Bordeaux. This collection was created according to the original plates that were awarded a gold medal at the 1867 World's Fair (Exposition Universelle) held in Paris. Collection created according to the original plates edited by Rousseau to Bracquemond etching for the 1867 World's Fair (Exposition Universelle). 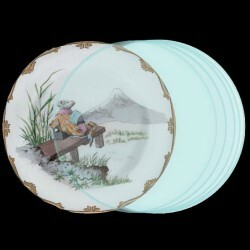 This collection was created according to the 19th century hand-decorated porcelain plates of Limoges. This collection was created according to the original plates edited by Vieillard in Bordeaux for the 1867 World's Fair (Exposition Universelle). Printing on tin was already put in practice in the 19th century by artists like Mucha for the famous « Lu biscuits ». This technique allows to create objects at affordable prices.